I originally posted this on In Between Swims but recent interest, a lack of good things to post and reasons to not forget have spurred me to post it again here. 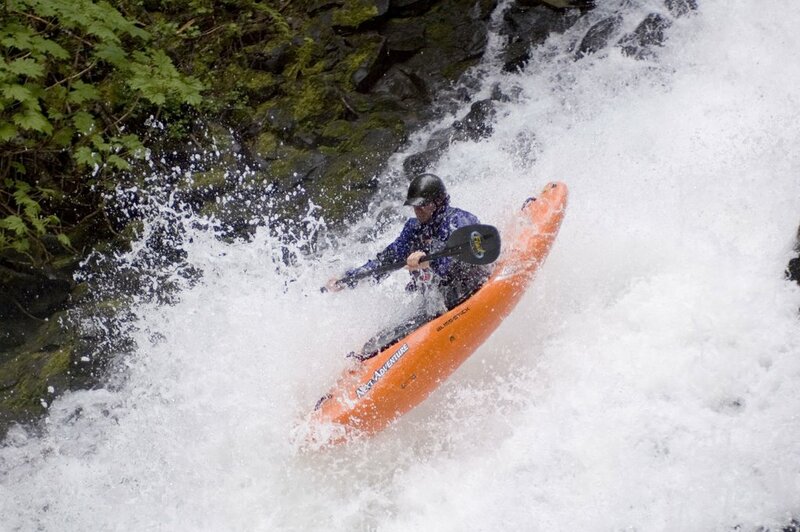 Those of us in the Pacific Northwest are some of the luckiest paddlers in the country. Classic class V runs abound and partly due to that, so do untapped, untold gems. Jason Rackley (www.oregonkayaking.net) is a whitewater explorer always seeking out the newest, steepest of such runs and thanks to his effort and Chad Bellville he found one right under our noses. This one has since recieved alot of press and made some waves in the northwest and hopefully has helped kayakers in the Columbia River Gorge near Hood River, Or. to not take it for granted that all the best runs have been found. The Green Truss of the White Salmon, the Little White Salmon, the Wind River and many others have long since overshadowed any potential exploratory steeps, save this one. This the my story about Kenobi Gorge,a sick gorge on Little Goose Creek, a trib of Trout Lake Creek, a trib of the White Salmon and how I am In Between Swims. Me: So, what are you up to this week? Mike: Something big with Jason. Mike: Are you sure, its pretty big. Me: Sure, I can walk it if I don't like it right? A few days later I find my self in Washington, in the woods with Jason and crew. Jason had opted out to shoot video letting the rest of us have all the fun. Little Goose Creek has a handful of good drops on it, some serious mank and a marginal 50 or so foot waterfall we named Imperial Falls. Mike, Ben and John put on at the top and ran a couple extra drops, including the mank and portaged Imperial. I carried my boat down the path and put on just below the big slide called The Kessel Run. After Kessel some more mank, a really fun double drop called Chewie which apparantly becomes a hellish swirly at higher flows. I had my fun a bit lower down. Mike Long makes Kessel Run in less that 12 parsecs. Right before the Gorge proper, we hiked up and out of the river canyon, to the rim and downstream to scout it out. We got to the fixed line that had been set up earlier. First drop looked straight forward, second drop was pretty obscured by the trees and I didn't feel like rappelling down and ascending just to look at the ledge just below so I move around a bit and said "So.... whats the line?" to which Mike Replied, "You wanna be 4 ft off the right wall and boof out." Mike ran first and stomped it, then John, who also came out clean. I got in my boat, paddled off down river, First drop, caught an edge, but got upright and got way right no problem.... (Right Wall and Boof) I was so far right, "This is gonna be easy, why were they so worried" (Right Wall and Boof) Then suddenly my nose went up on the right side (Right wall??) and I dropped over the lip a bit sidways (..boof??). Luckily it is screaming down through there so I cleared the seam, not so luckily I didn't get my edge up and I flipped over. "No worries," I thought just before missing my first and only roll attempt. After that I felt my paddle up against the wall (@#%!^$ Right Wall, @$^!$ Boof!!!) and soon after that I fell in the seam, gave up on the roll and pulled out. I remember a fleeting glimpse of white, kicking like mad before there was nothing but water. I was being held in the middle of the recirc, not getting tumbled, just sitting there agains that ! @$$ wall. I pushed off, got spun, tried to kick off with my feet got spun, this is one sticky hole. When I reached up and felt my boat there surfing with me I thought, "AIR" and pulled my head into the cockpit. Well the best laid plans of mice and men, I couldn't get a breathe, just kept sucking air into my stomach. I even had time to recall the physiology of the mammalian dive reflex where your body won't let you breathe if you are submerged. Its the reason why most drownings are "dry downings." I gave up on the breathing, and tossed the boat and suddenly, my head cleared the water and I start hearing the voices of angels (John, Mike and Ryan shouting) "ROPEROPEROPE" and I vaguely recongnized the dark blob floating next to me as my salvation. But alas, I got pulled back into the hole trying to hang onto my Gus as my trip out only managing to get a finger on the handle of it as it took off down the next drop. Luckily this pulled me out of the hole enough to get the rope John threw me and though I went right back in to the sticky maw we named Sarlac, John pulled me out and onto the rock where I took my first breath in what seemed like minutes (really about 40 seconds). 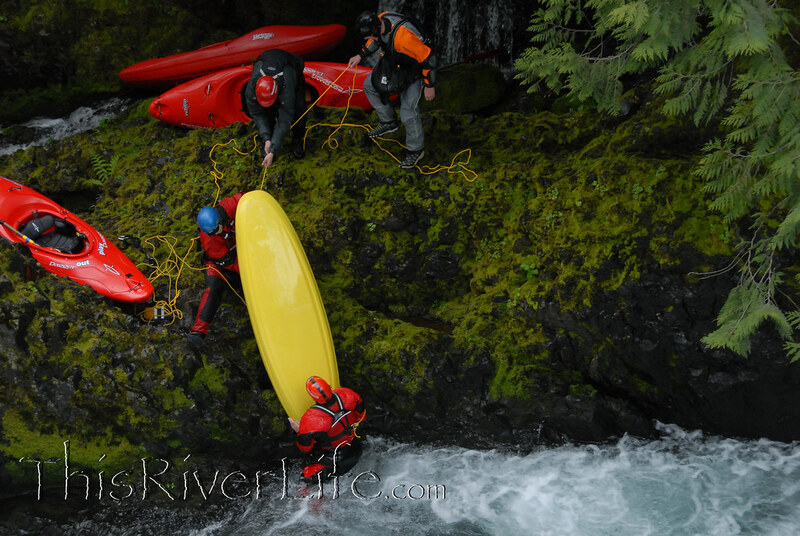 After Ben came down and I got myself collected thanks to the crew, we continued on down the river. I have never been so scared on a river as above the next drop we called Supercollider because of the way it hits you in the chest. The miles of class 2-3 paddling out helped me to collect myself mentally and I was in good spirits by the time we reached the take out. I have since decided I need a redemption run 4 feet of the @#%! Right wall this time! Next time I'll do better but hey we are all in between swims right? For a more complete trip report including video check here!